When my wife was a three-year-old little girl, she loved the Annie Oakley TV show; and as the music would begin she would mimic Annie Oakley by running across the room and jumping onto her “horse,” which occasionally would be her dad on his hands and knees without a real saddle on his back. The real Annie Oakley came to Daytona in 1922, but she came either to recuperate or to die. Many of us today are unaware that at one time Annie Oakley was the most famous woman in the United States, possibly the most famous woman in the entire world. She was such a trusted shooter that Kaiser Wilhelm agreed to let her shoot a cigarette as he held it in his mouth. Today we may know her from the Rodgers and Hammerstein Broadway musical, Annie Get Your Gun, but she was not just the best marksman the world had ever seen. She performed before the royalty of Europe. She was received by Queen Victoria. She was such a trusted shooter that Kaiser Wilhelm agreed to let her shoot a cigarette as he held it in his mouth. She would shoot a dime held by her husband between his finger and his thumb, and she would shoot while riding and also by laying the rifle on her shoulder, shooting over her back, using a mirror; and she beat all men in shooting competitions and became internationally known in Buffalo Bill’s Wild West Show in which she performed with Sitting Bull. Her career took her far and wide, but what brought her to Daytona Beach was a car wreck. 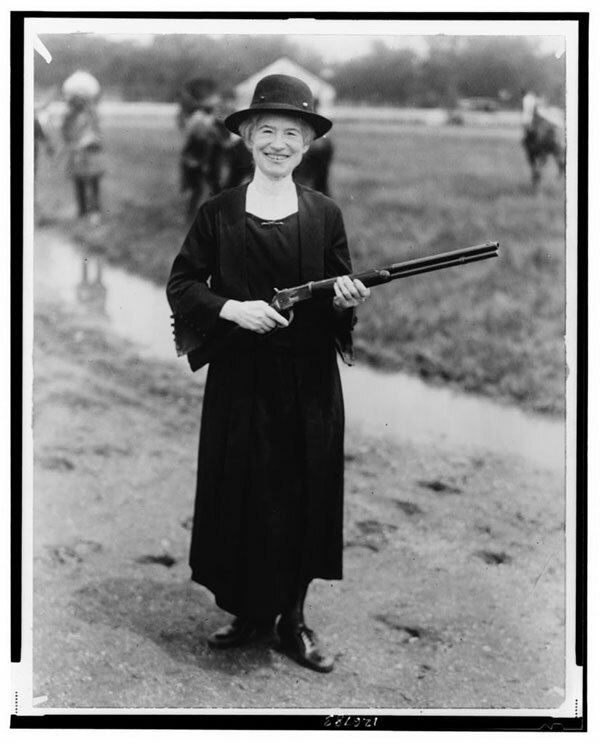 After a hiatus in her 38-year career, Annie Oakley returned to shooting performances in 1922, and her biographer Shirl Kasper has written that Oakley’s popularity was so great that in October at the Brockton, Mass., annual fair she was paid $700 for five exhibitions lasting only five minutes each. Although it was an unseasonably sweltering hot October 5th, 100,000 people came to the fairgrounds –a chance to see Annie Oakley’s shooting was not to be missed. A month later Annie Oakley and her husband took a boat to Jacksonville, Florida, where they sent their beloved dog, Dave, by train ahead of them to Leesburg, and on Thursday, Nov. 9, they continued their trip with their friends J. J. Stoer and his wife. The Daytona Beach Morning Journal reported the following Saturday that they were in a ”big Cadillac” driven by “a Mr. Young,” the Stoers’ chauffeur, heading south toward Daytona Beach on their way to Leesburg for the winter. The 1921 Cadillac models included a seven-passenger touring car, a seven-passenger open car, and a five-passenger sedan. These automobiles sold for as much as $5,090 the same year that the Model T Ford cost $370. For $5,000 in 1921 a person could buy an entire farm. Annie Oakley was riding in style. Traveling at what must have been a high speed, the Cadillac’s tires likely were growling a whirring noise as they raced over the red bricks of the Dixie Highway about 46 miles north of Daytona Beach when they passed another vehicle and the tires slipped off the bricks into what was likely a soft shoulder alongside the highway, causing the chauffeur to lose control. As he attempted to steer the huge car back onto the bricks, the Cadillac careened into the roadside and “turned turtle,” pinning Annie Oakley under the massive car. The Cadillac, which weighed more than two tons, fractured her hip and right ankle. Oakley was barely five feet tall, and during most of her years in Buffalo Bill’s Wild West Show she weighed only a little over 100 pounds. The Cadillac, which weighed more than two tons, fractured her hip and right ankle. What may have saved her, though, was that behind their car was a Mr. B. Benson of Fort Pierce who helped free her and drove her hurriedly to Daytona Beach. There, Oakley was admitted to Dr. Bohannon’s Hospital and Sanitarium, run by respected physician Clyde C. Bohannon. When she was stabilized, her husband went to Leesburg to retrieve their dog, and the husband and dog then rented a room near the hospital. After Oakley recuperated for several weeks through November and December, she was released from Dr. Bohannon’s care. But she was forced to wear a heavy metal brace on her right leg, and she still had to walk with crutches when she, her husband, and their dog finally left Daytona Beach. In Leesburg, Florida, 10 months later on October 8, 1923, she once again stunned the crowds with her rifle, and although she had to set aside her crutches and stand entirely on her good left leg, she “winged pennies tossed in the air at twenty feet,” Kasper wrote, and several times she tossed five eggs at once into the air with her left hand and shot every one before it hit the ground. Sixty-three-year-old Annie Oakley was still the greatest marksman in the world.